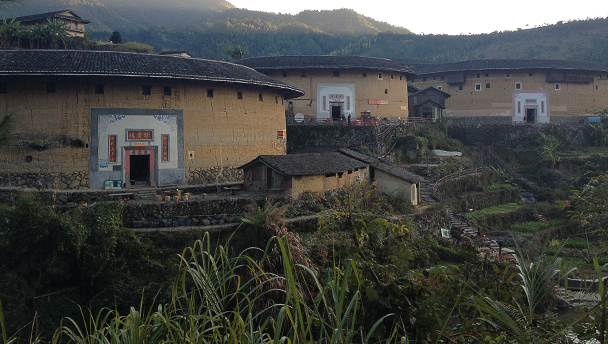 In Brief: Head deep into the mountains of Fujian to see the tulou buildings of the Hakka, visiting those both well-known and obscure, and staying overnight in a tulou building in one of the smaller, less-visited clusters. Trip includes sights around Xiamen, including Gulangyu Island. A cluster of three tulou buildings, deep in the hills of Fujian Province. Head deep into the mountains of Fujian to explore the tulou buildings of the Hakka, visiting those both well-known and obscure, and staying overnight in a tulou building in one of the smaller, less-visited clusters. On the days either side of the visit to the tulou buildings we’ll see a few of Xiamen’s highlights, including the Huli Hill Cannon Fort and the narrow lanes and Victorian architecture of Gulangyu Island. The highlight of this trip is definitely the overnight stay in one of the less-visited clusters of tulou (‘rammed earth buildings’), in a green valley deep in the mountains. Fly to Xiamen, visit seaside sights including Huli Mountain Cannon Fort, evening walkabout in downtown night market; overnight in Xiamen hotel. Drive to Yongding County and tulou area, check in at tulou guesthouse in small village, explore nearby tulou buildings; overnight in tulou guesthouse. Easy hike in the hills and rice paddies behind the village, drive to the Hongkeng tulou cluster area for a walking tour of the main buildings, drive back to Xiamen; overnight in Xiamen hotel. Tour of Gulangyu Island with included lunch; fly back to Beijing in the evening. Fujian is a coastal province in China’s southeast with a population of some 37 million people. Over 98% of the inhabitants are of the Han ethnic group, but the remaining 2% has room for 47 of the other ethnic groups that are counted as part of the Chinese population. The mountainous terrain in the northwest and the sea to the east mean that Fujian has been somewhat secluded through history. In more modern times the tough terrain and lack of road networks and railways contributed to slower economic development, which is said to be one of the main reasons that much of Fujian is still well-forested. The remote mountains and valleys were also seen as a refuge and became home to people from China’s north seeking to escape war and turmoil, particularly during the collapse of the Western Jin Dynasty in the fourth century, after the break up of the Tang Dynasty in the tenth century, and during the transition from the Ming Dynasty to the Qing Dynasty. 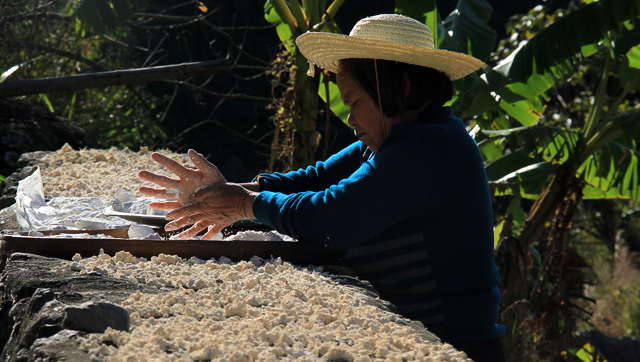 A Hakka matron preparing crushed yams for drying. Some of the refugees were of the Hakka ethnic group. Originally said to have been Han Chinese from the Central Plains of China, the Hakka migrated southwards through Fujian and then on to other parts of southern China, receiving the appellation ‘guest family’ from inhabitants of the areas they passed through, a nickname that eventually stuck. The Hakka people who stayed on in the valleys and mountains of Fujian Province are the ones who began to build the tulou, fortress-like structures of rammed earth and stone. A cluster of three tulou buildings. Deep in the mountains of Fujian are more than 20,000 tulou buildings, built between the twelfth and twentieth centuries. “Tulou” translates literally as “earth building”, and rammed earth is what they are mainly constructed of, with other locally sourced materials like rocks, stones, and bamboo mixed in to create the walls, and a wooden frame of beams set up inside to support the balconies and rooms that run around the inner walls. The thick and tall walls of the tulou enclose a space large enough to hold a small community of people, commonly a clan of several generations. The buildings are a defensive structure that combines rammed earth construction techniques brought from central China with southern Chinese wood construction, and the result of a gradual improvement of the first basic forts built to protect inhabitants from threats that included armed bandits and wild animals. From the outside, the tulou appears completely closed off. Inside, it is an open space, with rooms and living areas around the outside wall and a communal area in the middle that includes a small hall used for gatherings and ancestral worship. Site: The site of the building is selected and marked up according to fengshui principles, and the layout of the tulou is outlined on the ground with lines of lime. Foundation: a deep pit that follows the outline of the walls is excavated to make a strong foundation for the rammed earth walls—the bigger the tulou, the wider and deeper the pit. When necessary, thick pilings of pine were used to create extra support for the stone foundation, which fills the pit. The stone foundation finishes above ground level, keeping the rammed earth walls nice and dry in the event that puddles of water build up on the ground because of rain or flooding. Walls: The walls are built in sections, using boards to form the shape. The earth is poured into the forms and rammed, a long and complicated process with many steps, checks, and special techniques. The wooden frame is added in storey by storey. Roof: The roof of a tulou is tiled, and the eaves of the roof extend quite a way out so that the potentially erosive runoff from rain is kept well away from the walls. Entrance: There’s typically only one main door, which is big and reinforced – often the whole frame was made of a single piece of solid granite. Generally this is the only way in and out of the building, but secret escape tunnels were constructed under some of the tulou. The outside of the lower storeys of the tulou are windowless, for defensive reasons. Inside, the rooms of the lower levels are used for storage, with the thermal mass of the rammed earth walls regulating the temperature. The upper levels of the inside of the tulou are the living area, ringed by balconies, with ladders and stairs between levels. The balconies are supported by struts embedded in the rammed earth walls. The walls surround a communal space, with a hall for gatherings and the worship of ancestors. In some of the larger tulou the communal space contains more halls and structures, sometimes constructed in several concentric circles. 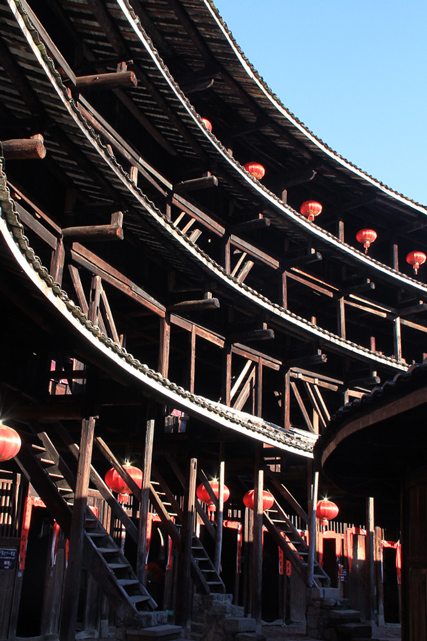 We’ll tour several of the main tulou clusters, aiming to avoid the areas crowded by tourists. 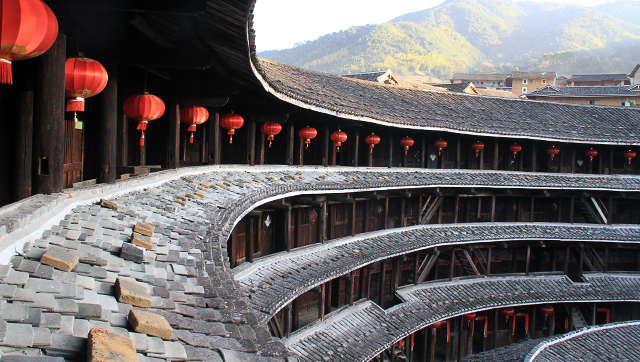 At Chuxi Village there is a cluster that contains three very large circular tulou, as well as a few that are square shaped. The main tulou in this cluster is Jiqing Lou, built in 1419. Jiqing Lou is one of the largest tulou: it’s four storeys tall and has more than 200 rooms, and there’s a second ring of rooms within the main walls. Chuxi Village is picturesque, surrounded by green hills and with a stream running in front of the tulou buildings. Keep an eye out while we’re looking about – in one of the tulou here you’ll find a huge white snake. A large tulou in the Hongkeng tulou cluster. The tulou cluster at Hongkeng Village is spread out on either side of a river, and is full of all sorts of tulou: round, square, U-shaped; short and tall, big and small. Parts of this cluster have been developed for tourism, and we’ll use the tourist trail either side of the river as a base for our tour, visiting the main sights along the way. 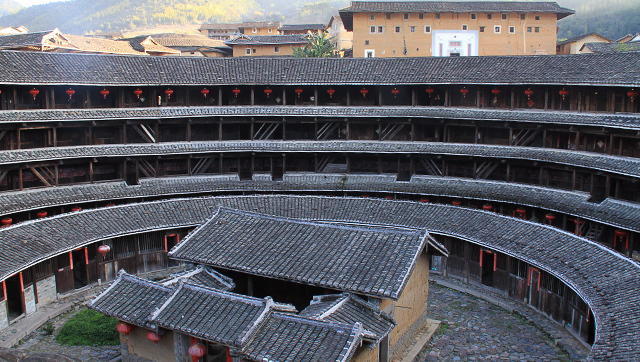 The earliest tulou in Hongkeng date back to the Song Dynasty (960-1279), making them some of the first to be built. One of the main tulou here is Zhencheng Lou, a round tulou with a two storey inner ring. 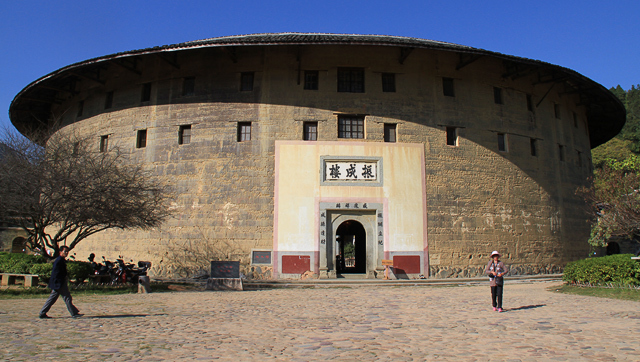 Zhencheng Lou is one of the most recently built tulou, finished in 1917. The main dialect spoken by people who live in the area is one of the varieties of the Minnan family of Chinese languages, a tricky one with five to six tones. Add the perhaps strange sounds of a new language to the sights of the unique architecture here and you’ll certainly feel you’re seeing (and hearing) a different side of China. Also known as Amoy, Xiamen has long been the site of a busy and coveted sea port: goods were traded out of here during the Song Dynasty (960-1279), a fort was constructed during the Ming Dynasty (1368-1644) to guard the harbour against pirate incursions, and the huge cannons of the Huli Hill Fort, built during the late Qing Dynasty, saw action in World War II. European traders began to visit Xiamen in 1541, and as well as trading goods and money they took words from the local dialect which found their way into English, the best example being “tea” (tê in the Minnan dialect, versus chá in Standard Mandarin). Xiamen was also the base for the last bit of resistance by the Ming Dynasty against the Qing Dynasty, and at that time was known as Siming, which translates as “Remember the Ming”. The name remains attached to Xiamen’s waterfront district. 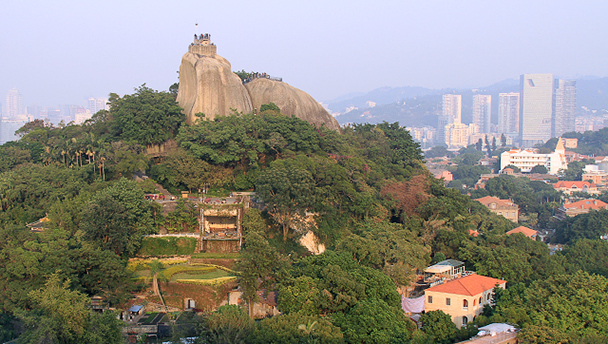 Xiamen was captured by the British in 1841, during the First Opium War. In 1842 it was one of the five treaty ports opened as part of the Treaty of Nanjing. Around that time a European settlement developed on Gulangyu Island, and the leftover architecture makes the island a popular tourist destination. Xiamen has been a Special Economic Zone since 1980, and its port is one of the busiest in China. Built in 1894, the Huli Hill Cannon Fort is most famous for its matched set of 60-ton Krupp cannons, a huge expense back in those times. Fortifications, smaller cannons and pillboxes remain, as well one of the big cannons—it may be the one that sunk a Japanese warship in 1937. The fort sits atop cliffs at the south end of Xiamen Island, and the main attraction for us is the views of the sea and islands. On a clear day we might be able to see Kinmen Island, which is only 10km off the coast and actually administered by Taiwan. Riguang “Sunny Peak” Rock, in the middle of Gulangyu Island. During the time Xiamen was a treaty port, Gulangyu Island was the site of the consulates, churches, and hospitals of some thirteen countries, including Great Britain and France. These buildings remain, and are in the Victorian style of architecture. Some are in excellent shape, and house museums, shops, and hotels. Others are shuttered and empty – quite a spooky sight! As well as their style of architecture Europeans also brought their pianos, and a strong tradition of piano-playing remains. The pianos stayed behind when the Europeans left, and Gulangyu’s Piano Museum holds a huge variety. Gulangyu Island is free of cars and bicycles, and is only ten minutes by ferry from downtown Xiamen. Just a wee bit kitschy, the island is not free of tourists, and can get quite busy. The ban on vehicles doesn’t extend to the electric carts used to cart around the more out of shape tourists. If you’ve visited Nanluoguxiang in Beijing you’ll find that Gulangyu is a little similar: popular spots thronged with tourists, and little side streets and residential areas frequented mostly by locals. We’ll make a relaxed tour of Gulangyu Island, taking a stroll through the residential district to the west side of the island, walking along the beachfront promenade, and climbing the steps up to the aviary and the Piano Museum. We’ll find time for a tasty restaurant lunch before walking back through the shopping streets to find the ferry again. 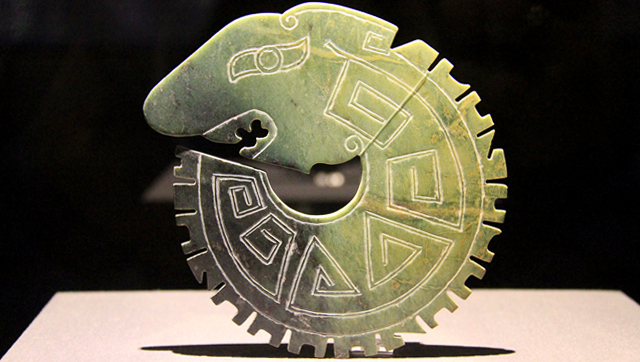 One of the Neolithic jade artifacts on display at the exhibition. On the way to the Huli Hill Cannon Fort we’ll stop off for a look at an exhibition of jade artifacts. The gallery brings together many private collections of jade into a huge exhibition containing many beautiful and ancient pieces. Of particular interest are the Sanxingdui pieces: made by a civilization previously unheard of and discovered only in 1987, and in an artistic style not seen before in the history of Chinese art. Some of the faces and figures of Sanxingdui artifacts look rather unearthly! As well as being beautiful pieces of art, the jade sculptures and tools are a good way to start thinking about what people were up to in China, all that time ago. On the first night of the trip, we’ll take a stroll through the streets in an area of downtown Xiamen where we’ll find lots of little shops and outdoor dining. A good chance to try some local street food, and to get some fresh seafood cooked up on the spot! The weather in Fujian is fairly mild, although at this time of year some rain is expected. In the area of the tulou buildings, the temperature should be between 12–25°C (54–77°F). There’s a small chance it will rain, and November sees the year’s second-lowest amount of rainfall, by month, in this area. In Xiamen, the weather will be very similar, with temperatures between 17–25°C (63–77°F) and the chance of some rain. We will be staying in a 5-star hotel in Xiamen, and in comfortable countryside accommodation in a rustic but tidy tulou in one of the smaller villages of the area. You’ll be sharing a room at the hotel and guesthouse with another hiker. If you'd like a hotel room to yourself, it can be arranged at an extra cost of 750 RMB for the whole trip, if a room is available—usually not a problem! We’ll fly to and from Xiamen from Beijing Capital Airport on our departure and return days. We’ll have a private bus for our travel between the other places on our itinerary. In Xiamen we’ll eat at city restaurants or at our hotel, and the food served will be typical Chinese dishes and some local specialties, all washed down with beer. We’ll also make a visit to one of Xiamen’s popular nighttime food and snack streets. If you’re a seafood fan, you’ll be very pleased! While in the tulou area we’ll eat at the guesthouse restaurant of our hosts, and the menu will be a mixture of what’s fresh locally at the time and standard Chinese food. Our hosts also brew their own rice wine, and we’ll definitely sample a little of that! Warm clothes for the evenings. Sturdy shoes, hiking boots if possible. Personal medicine, anything you can't do without but won't likely find in smaller cities or towns. A four day trip that took us into the mountains of Fujian to explore the tulou buildings of the Hakka people, and to Xiamen to see both ancient and more recent cultural and historical sights.